"Winnie the Pooh" is a popular Soviet cartoon (1969) based on Alan Alexander Milne's classic children book. The latest themed train on the Russian capital’s famed subway system features characters from classic cartoons. Lucky riders on the Serpukhovko-Timiryazaevskaya (gray) line of the Moscow metro will get to share their commute with Cheburashka and Gena. 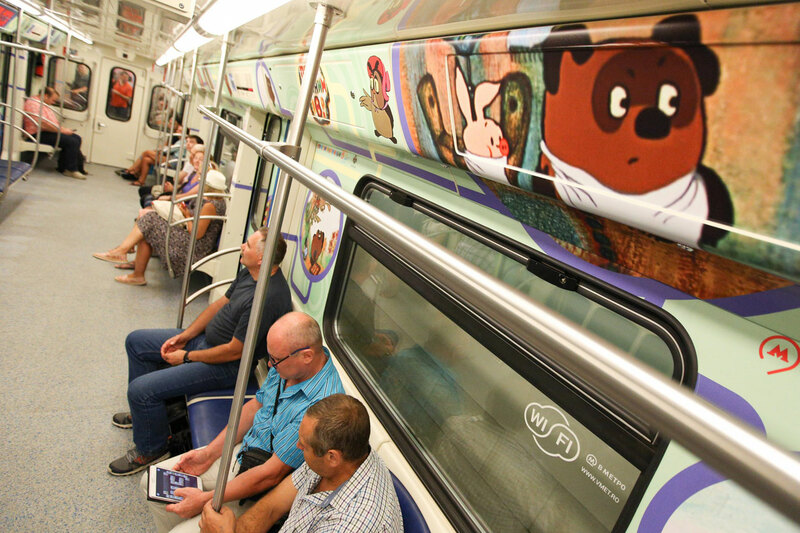 On Aug. 29, the Moscow Metro launched a special train commemorating the 80th anniversary of Soyuzmultfilm, the largest Soviet and Russian animation studio. The design of the train cars, which took about four months to create, features images of characters from classic Soviet cartoons, including Once Upon a Dog, Junior and Karlson, Hedgehog in the Fog, The Bremen Town Musicians and many others. The train also celebrates the studio's talented filmmakers, so while riding, passengers can learn more about such animation artists and directors as Boris Dyozhkin (Cipollino, Revenge Match, Shaybu! Shaybu! ), Lev Atamanov (Kitten Named Woof), Fedor Khitruk (Winnie the Pooh) and Roman Kachanov (Cheburashka, The Mystery of the Third Planet). The launch of the new train will be accompanied by a release of special-edition one- and two-ride tickets. The animation train is the fourth themed train dedicated to cinematography on the Moscow Metro. The other three trains, "Heroes of All Time", "Victory Cinema" and "Movie Legends," all run on the Koltsevaya (brown) line.